You can't evaluate who is better without knowing whose move it is! which looks like fun. Unfortunately it also looks like only one of many options, so "1-0, time" seems the other general pointer. Isn't black much better because of the threats of g5-g4 and Rf6-h6 (against which this particular patzer can't see a decent defence)? Indeed so - which is why I wrote "Black to move" under the diagram. I confess I'd not even considered the idea of 1. ... d4. i'll have a look now though. I thought Black was getting a good kingside attack too but I wasn't convinced I was right. Not an adjourned position I hope, JB. Not an adjourned position nope. It looks like White is better as he can drive the knights away with f3 and b3. They're not actually threatening anything just yet. f3 is useful for White as he has the option of Bg4. (Which is desirable if ...Ng5). After seani's line 6.e7! is winning. I would like to play 1...Rf6 which might be equal after 2.f3 Ned2 3.Bxd2 Nxd2 4.Qxd2 but White should instead play 2.g4 followed by f4 and g5. I wondered if 1...Qe5 might be good. It's a different method of supporting a knight on e3, discouraging b3. Black is in no rush to capture the e6 pawn. 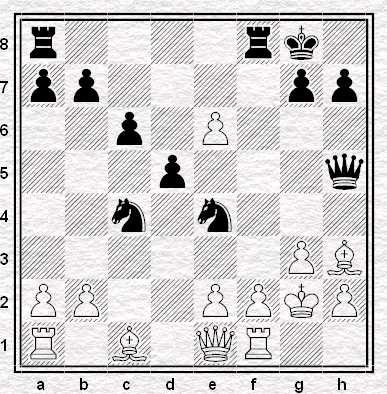 Any pawn moves by White weaken his position. The difficulty lies in making progress if White does nothing. How about 3.Qd1 as an improvement? Did someone's mobile phone ring? Somewhat mundane than that Neill. the answer is 'somewhat more mundane than that' I meant to say.